WASHINGTON (Reuters) – Prime Minister Benjamin Netanyahu bluntly told Barack Obama on Monday that he would never compromise on Israel’s security even as the U.S. president sought to reassure him on Iran nuclear diplomacy and pressure him on Middle East peace talks. In a White House meeting overshadowed by the Ukraine crisis, the two leaders avoided any direct clash during a brief press appearance but were unable to paper over differences on a pair of sensitive diplomatic drives that have stoked tensions between them. Obama assured Netanyahu of his “absolute commitment” to preventing Iran from developing atomic weapons, despite the Israeli leader’s deep skepticism over U.S.-led efforts to reach a final international deal to curb Tehran’s nuclear program. But Obama also urged Netanyahu to make “tough decisions” to help salvage a faltering U.S.-brokered peace process aimed at reaching a framework agreement with the Palestinians and extending talks beyond an April target date for an elusive final accord. 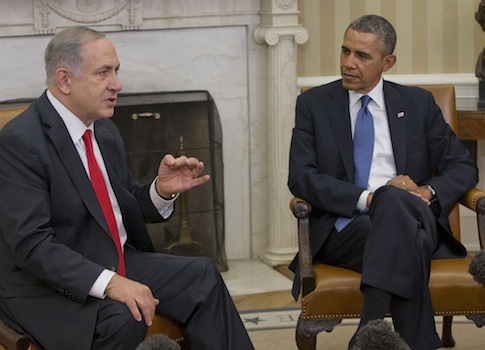 “The Israeli people expect me to stand strong against criticism and pressure,” Netanyahu told Obama. Obama and Netanyahu, who have had strained relations in the past, showed no outright tension as they sat side-by-side in the Oval Office. Both were cordial and businesslike. But their differences were clear, and when the talks ended after nearly three hours there was no immediate sign of progress.